Once upon a time, there was a prince who was single and very eager to marry a lovely maiden for his future queen &..." So begins Kierkegaard's classic parable that shows the extent of God's love for us and how He desires from us a love that is free and voluntary. 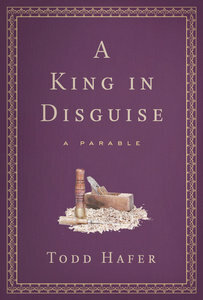 With a sweep of imagination, award-winning author Todd Hafer weaves a remarkable tale of that prince's journey and adventures from the king's court to a humble and obscure village to win the hand of his beloved. As the moment of truth arrives, the reader will not be able to escape the greatness of God's love for each of us. About "A King in Disguise"
Jedd Hafer is a standup comic who has performed with some of the top comics in the nation and is the director of The Children's Ark, a home for troubled teens. Jedd and his family make their home in Colorado.